Hey, hey, hey! We’re so very pleased to announce the addition of a brand new children’s book to the list of RWYK Certified Great Reads. Congratulations to Ellie Elf for winning the RWYK Great Read title for her wonderful children’s Christmas picture book Finding Santa: The Adventure of Greedy Elf. Placing a Reading With Your Kids Certified Great Read seal on a book or product tells parents, grandparents, educators, and caregivers they are giving their kids the very best. We have thoroughly enjoyed reading Finding Santa and have carefully taken into consideration all the factors that make it a Reading With Your Kids Certified Read. Finding Santa beautifully demonstrates the transforming strength of love. And we hope you and your family enjoy reading this cute Christmas book as much as we did! This Christmas picture book makes you part of the Adventure. What happens when one of Santa’s elves doesn’t want to share anymore? Using magic, Greedy Elf shrinks Santa and takes over Santa’s workshop. Solve the clues that a pixie leaves behind and break the spell. Told by Ellie Elf, Santa’s photographer, her story illustrates the transforming power of love. This 34-page picture book is 8.5 x 11 and is available in both print and Kindle versions. Add one to your cart and join the adventure. When not scurrying around taking pictures of North Pole things, Ellie Elf spends her time in a warmer climate with her husband, kids, and pets. Finding Santa: The Adventure of Greedy Elf is the perfect holiday treat! 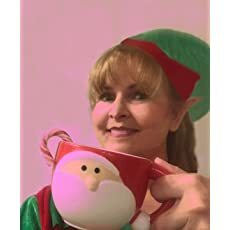 Finding Santa: The Adventure of Greedy Elf is a delightful children’s Christmas picture book written by Ellie Elf, Santa’s photographer. The story follows a greedy elf named Gus who works as a toymaker in Santa’s workshop. He was such a good worker that Santa invited him to deliver toys with him one Christmas. On their very first delivery, greedy elf discovers a broken toy of a child and decides that he didn’t t want to give toys to children anymore. He wants to keep every toy for himself. He starts to strategize his plan with the winter wizard. Using magic, Greedy Elf shrinks Santa and takes over the workshop. Just when the greedy Elf thinks his plan is successful, Lucy, a tiny pixie comes to Santa’s rescue. She follows Greedy Elf when he is busy putting clues along the path. Will Lucy be able to solve the puzzle and help Santa escape? Grab a copy today and help find Santa and break the wizard’s spell! Charming and beautifully illustrated, Finding Santa: The Adventure of Greedy Elf delivers an interesting story in a delightful and unique fashion. The photo style pictures are extremely charming and remarkable. To make it more interesting for young readers, the story is heavily sprinkled with pictures and clue cards to keep the young readers engaged. It is very well thought out and the pictures have amazing details. The thing I love most about this book is that it comprises a wide variety of puzzles that are short, precise and easy for kids to read and understand. It will challenge and enrich kids mind and will help them to indulge in more of reading. It is a kind of exercise for the brain too. Another fun activity to do with this book would be to turn it onto a board game and have fun playing the game with your family! Filled with beautiful photograph style pictures and fun riddles, Finding Santa promises to liven up any boring day! The other thing I love about the book is the message it sends out to kids by showing that greedy Elf is in Santa’s timeout because he did the wrong thing by betraying him, however, Santa decided to give him a second chance. What an adorable way to introduce children to learning forgiveness -one of the many great values small children should learn early. This is an excellent book on forgiveness with great, colorful artwork and a fun storyline. I highly recommend it for ages 3-8. A big thank you to author Ellie Elf for providing us a free copy of this book through Reading with your Kids certified program. The opinions expressed in this review are entirely our own. PreviouslyChildren’s Author Interview: Reading With Your Kids Podcast!